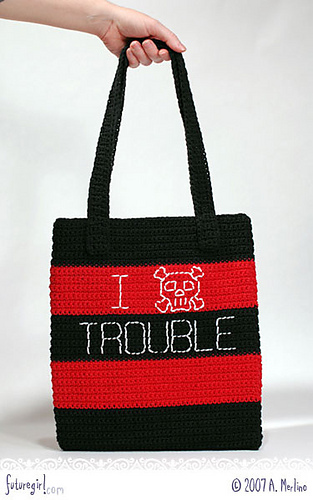 You can fit all your thumbscrews, skeleton keys, and bone saws in this generously sized crochet tote. 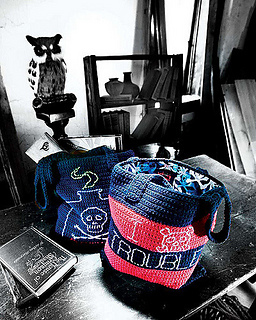 Both the solid-colored Apothecary Tote and the striped I skull Trouble Tote are lined to add strength and durability. 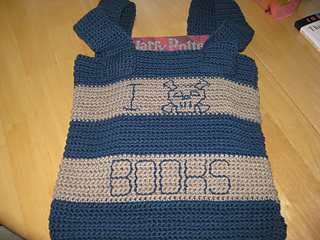 The tote body is made using a seamless crochet technique, so there are no seams to worry about. Price quoted is for entire book. 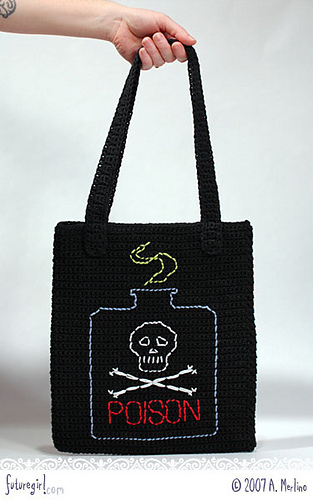 Photo by Al Parrish, courtesy of F+W Publications, Inc.
Anticraft: Knitting, Beading, and Stitching for the Slightly Sinister contains eight knitting projects, eight crochet projects, three sewing projects, three jewelry projects, one duct tape project, one beading project, and one cross stitch project.